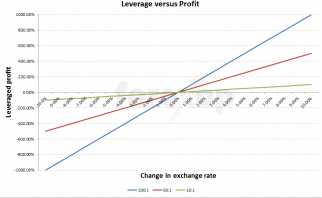 One of the advantages of trading markets such as forex is the availability of leverage. When used correctly, leverage can help you to achieve much bigger returns than you’d normally be able to with your own money. As with all things, leverage needs to be used carefully and in moderation. When someone buys a company stock it’s usually a simple transaction. They pay an amount to a broker and in return receive a fixed number of shares. Each share has a certain value and that value can change according to the market. With this kind of transaction, the buyer puts all of the money up front. Forex, futures, and many other financial instruments are usually traded on margin. This means when you trade them you don’t need to put all of the money up front. Instead, the broker asks for a certain percentage to cover the transaction. This amount is held on margin and allows what’s called leveraged trading. Leveraged trading means that you can control much bigger position sizes than you would otherwise. Let’s say you buy the currency pair EUR/USD. What you are doing in effect is selling US dollars, and with the proceeds buying euros. When you enter into the contract, the spot exchange rate determines precisely how many euros you can buy for the dollars you sell. The variable in this transaction is the 1.5, the exchange rate. Suppose tomorrow the exchange rate is 1.6. To sell your position you’d need to sell the euros and buy back the dollars. Now if you wanted to sell the euros at today’s spot rate you’d receive USD 160,000. You could use USD 150,000 of this to purchase back the US dollars. That leaves USD 10,000 profit. On day one, the forex contract had a net value of zero. On day two it had a value of USD 10,000. If the exchange rate had moved the other way, the value could have been minus USD 10,000. The sold dollars exactly matched the bought euros at the start. But the value changed over time according to the exchange rate between euros and US dollars giving the profit or loss. Unlike the share purchase example the transaction didn’t have any initial value. In this imaginary deal, you didn’t have to put in any of your own money up front. Under this scenario, you could just walk away if the exchange rate moved the wrong way and it resulted in a loss. To prevent this, brokers require something called margin. This is money you hold in your account to cover your trading positions. Used margin is locked by the broker until the trading position is closed. Leverage is set by the amount of margin you must keep in your account to cover each position. The less you need to hold, the more your leverage. The more you need to hold the lower your leverage. Brokers have different margin requirements for different instruments and according to your account currency. They can change margin rules at any time depending on market conditions and volatility. Leverage is commonly set as a ratio. In foreign exchange trading, ratios can be 10:1, 50:1, 100:1 or even 500:1. Let’s say your account allows up to 100:1 leverage. In the example above, you would need to hold at least 1/100th of the position’s value in your account. Initially, you would need to have at least 1000 EUR in your account to be allowed to enter into this forex contract. This is called initial margin. However, when you bought EUR/USD you sold USD. Since you’re short USD, the US dollars need to be bought back when the position is closed. So your margin needs to be calculated in USD and not EUR. If USD increases in value against the euro, this will also affect your margin. If the exchange rate fell to 1.49 your long euro position then only buys back 149,000 USD. This is 1000 USD short of where you were at the start. Now because of the unrealized loss of USD 1000 you only have USD 500 free margin. Your broker would then demand that you pay an extra 1000 USD to cover your margin requirement. This would keep your leverage at 100:1. This is called marking to market and is done on a daily basis. If your free margin doesn’t cover the new margin amount, you’ll receive a margin call. This will result in the positons in your account being closed automatically to cover the losses. Is Leverage Your Friend Or Foe? In the above example, you could potentially have profited from selling 150,000 USD whilst only putting up 1500 USD of your own money. If the EUR/USD exchange rate had moved by just 1%, you could have doubled your initial investment. You would have made a 100% return. This is because your leverage was 100:1. On the flip side, if the exchange rate had moved by -1% you would have lost all of your initial investment (the 1500 USD margin). See the table below. So leverage magnifies your gains as well as your losses. If you time the market correctly, leverage is your best friend. Time it badly and it could be your worst nightmare. Leverage has the potential to help you reach your profits much quicker. But with this comes higher risk. The risk is that if the market turns against you the losses will be much greater than had you been trading without leverage. 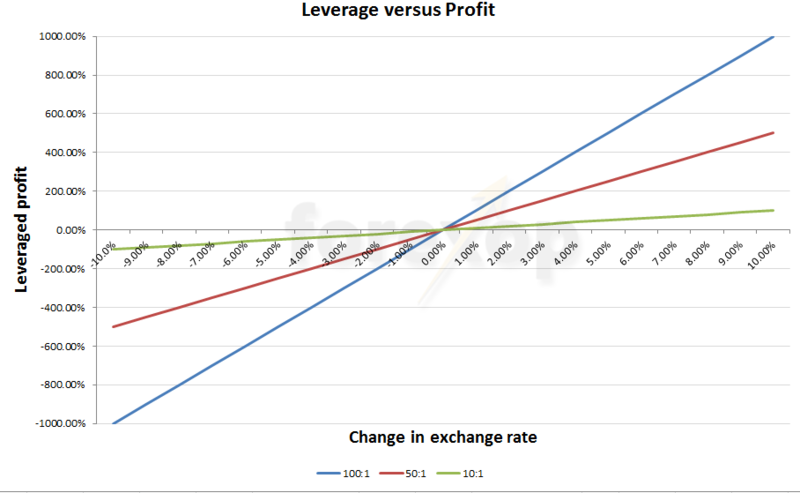 The diagram below shows the effects of profits and losses on leverage. The green line shows leverage at 10:1. With this a ten percent move in the market can potentially create a return of 100%. When leverage is 10 x higher at 100:1 the gains are even greater. Just a one percent move in the exchange rate can produce a profit of 100%. Clearly this is very appealing for people who don’t mind taking the extra risk. This is one of the things that attract many to foreign exchange trading in the first place. What Is A Good Leverage Level? Keep in mind that the higher your leverage the less room there is for error in your strategy. A few losing trades can take out a large percentage of your capital. Some try to limit the risk of high leverage through tight stop losses. This is a common mistake with new traders and most of these individuals end up burning through their account funds very quickly. A stop loss is only an instruction to your broker. There’s no guarantee that your position will close at that level and so limit your downside. When high leverage is involved, a slippage of the closing price can create a very big loss. If leverage is too high, a big move in the market can leave you with a negative account balance. How risky is your strategy? Which instruments are you trading? What is your average holding period? Do you have backup funds available? All of these factors will play into your overall decision. With riskier strategies, you’ll certainly want to use much lower leverage. 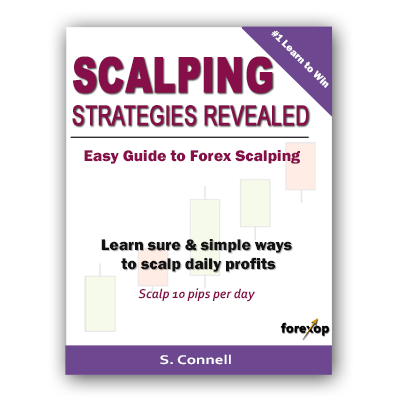 However strategies like arbitrage trading can require high leverage because the gains per transaction are relatively small. Brokers will have certain margin rules depending on the markets you are trading and how volatile they are. The more volatile and unpredictable the market, the higher the margin your broker will demand. The average holding period is also crucial in deciding leverage. For example a day trader who only holds a position for a few hours could utilize a higher leverage than a carry trader who needs to hold their position for months to years. Ultimately your leverage will also depend on what your broker is willing to allow you. US brokers have tighter regulation and they restrict leverage to a maximum of 50:1. European and offshore brokers typically allow much higher leverage, sometimes as much as 1000:1. Be aware that margin rules can change at any time. That means if you’re below the minimum you’ll need to have the funds to top up your account to prevent your broker closing your positions. Just because your account allows certain leverage, it doesn’t mean you need to use it. It just sets the minimum funds you’ll need to keep in reserve. In practice, leverage is set by the amount of cash you have in your account.